The month of June caused some consternation among Tigers fans, but the overall numbers look pretty good. They easily could have won a few extra games, but in general it’s hard to be too upset with the second best offense in baseball during the month (118 wRC+) and the 4th best pitching staff (3.9 WAR), placing their season ranks at 2nd (112 wRC+) and 1st (16.6 WAR). The Tigers might not have a record that perfectly lines up with the overall performance, but those things will catch up as the season wears on. Despite struggles over the last two weeks, the pitching staff still stacks up across the full season as the Tigers feature 4 starters with 2.8 WAR or better, not to mention Porcello’s (1.5), Smyly’s (1.3), and Benoit’s (1.0) strong performances. Verlander wasn’t his usual self during June and Sanchez only threw 10 innings due to injury, but Scherzer, Fister, and Porcello all offered sub 3.30 FIPs and Smyly and Benoit were lights out. If you can block out Valverde’s 9.45 ERA and 9.81 FIP during the month, you’d probably have a much nicer record. A lot of fans have taken the last few days to jump off the bandwagon, but there are really no signs that is warranted. The Tigers remain one of the best hitting teams in the league and have the best staff in the game and didn’t perform much off that pace in June. Fans tend to only watch their own team very closely and tend to make a big deal out of what they perceive as flaws, when in reality those “deficiencies” are typical features of baseball. Relax, everyone. Baseball is fun and this is an excellent team. The Moment: Victor Martinez makes a potential play of the year against the Sox at first base on June 23rd. While we didn’t see the Rick Porcello (4-6, 86.1 IP, 5.21 ERA, 3.65 FIP, 1.5 WAR) who dominated hitters from May to mid June, we saw an effective Porcello who went 6 innings and gave the Tigers a chance to win. He allowed 3 runs, but only a couple of well hit balls to go with 2 BB and 3 K. Miguel Cabrera crushed a 4th inning HR into the Ray Tank, but the Tigers wouldn’t get any more despite loading the bases with no outs in the 7th. After taking the opener so cleanly on Friday, losing the last two so closely stings, but probably not as much as Ben Zobrist’s right shoulder after Leyland ordered Porcello to hit him in the first inning because Jim Leyland thinks baseball needs more violence. Hopefully, MLB will suspend Leyland, but the odds of that seem quite slim because MLB tends to support this kind of childish behavior. 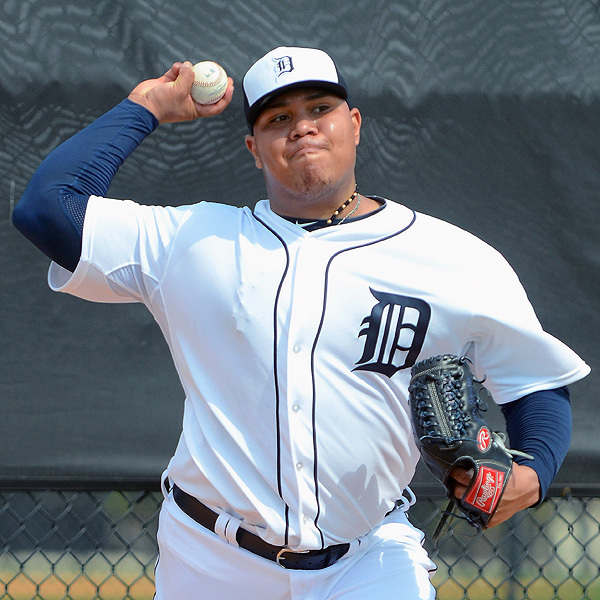 It’ll be a quick turnaround after the flight to Toronto as the Tigers will face the Jays Monday at 1pm with Jose Alvarez (1-1, 16.2 IP, 3.78 ERA, 5.70 FIP, -0.1 WAR) hopefully making his last start for a while with Sanchez’s return looming. The Moment: Cabrera sends one into the Rays Tank in RCF, just the second player to ever do so. You’ll recall earlier this week we introduced are very own reliever rankings called SOEFA, which you can read about in detail here. For a brief refresher, it combines strand rate, expected OBP against, ERA-, and FIP- into a deviation from league average. Zero is average. This includes all pitchers who have thrown at least 20 IP in relief. Should you wish to know the SOEFA for any other reliever, or on a day that isn’t Sunday, hit us on Twitter or in the comments section. Will Chris Sale have another great outing? I’ve often chided Sale for his delivery because it looks like he’s about to require TJ surgery after every pitch, but it’s working for him and he’s healthy so far. He’s also had a couple of great outings lately that his team didn’t support very well and he’s looking to keep at least half of that equation going. As I prepare to update the Appointment TV list of starters on Tuesday, Sale is definitely on notice. Another great start and he’s a lock. A solid one and he should still make it easily. Sale’s currently 13th among starters in WAR with 2.7 and has improved across the board this season after a very strong 2012. 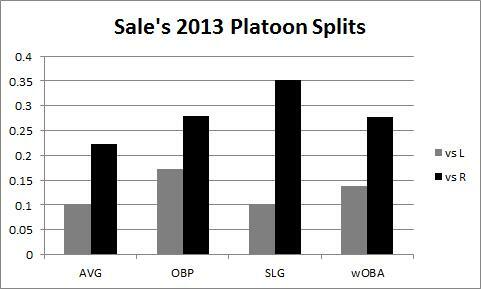 His platoon splits are fun to look at, too. The strikeouts and walks are pretty similar, but man is the triple slash line crazy. Lefties don’t strikeout more or walk much less than righties, but they are essentially helpless. They have ZERO extra base hits. I would recommend Francona avoid playing his lefties. Just a thought. Or outlaw the slider. The Tigers will saddle back up Sunday behind Rick Porcello (4-5, 80.1 IP, 5.27 ERA, 3.66 FIP, 1.3 WAR) who will look to lead the Tigers to a series victory. The Moment: Verlander gets through 8 for the first time this season. At New English D we’re among the those who wish to see the pitcher win removed from our baseball consciousness. It doesn’t measure an individual pitcher’s skill, but that’s how people use it. A pitcher’s won-loss record is about his performance, but it’s also about his defense, his run support, the other starting pitcher, and the other team’s offense. Also, luck, but I’m fine with luck. Matt Harvey (Go Heels!) is better in games he doesn’t win than almost every other pitcher in the league is overall. It’s time we get his back. The rules are simple, these are The Nine best season by Wins Above Replacement (WAR) for qualifying starting pitchers who won fewer than nine games. In MLB history, there are 8286 qualifying seasons from 1901-2012 with 1187 finishing with fewer than 9 wins. These are the best. Wins generally correlate with good performance, but there are many cases in which good performances don’t result in wins and bad performances do. Pitchers can improve their likelihood of victory by pitching well, but they can’t guarantee it. Wins aren’t a completely useless measure of pitcher performance, but when we have so many statistics that are dramatically better, why should be place any importance on wins? Here’s some evidence writ large. 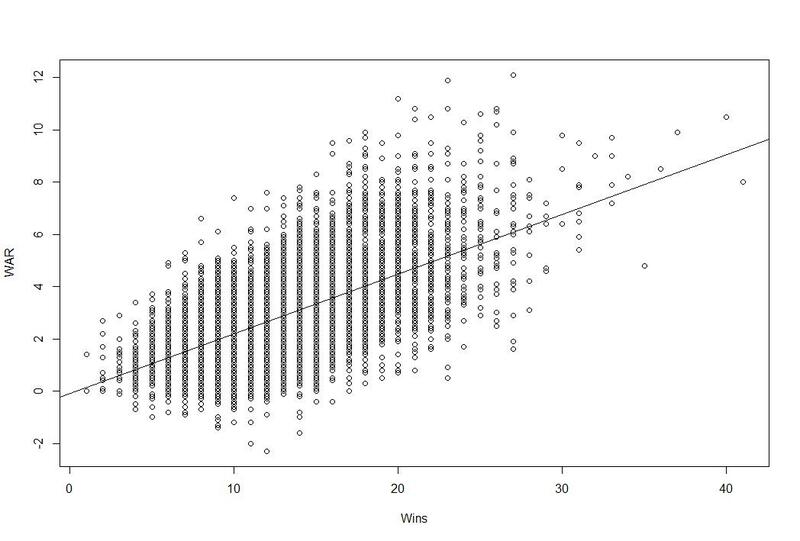 If we use Wins to predict three other statistics, WAR, ERA, and FIP, it doesn’t look good for wins. What these numbers tell us is that 38, 24, and 13% of the variation in these numbers can be explained by variation in wins. Let’s give Wins the benefit of the doubt and pick WAR for the graph. There is a clear trend, but there is a lot of variation in WAR that wins can’t explain. The sample size here is over 8,000. You can be both terrible and amazing and achieve the same number of wins. Parallel tracks usually take you to the same location and that’s the story of this game. Max Scherzer (12-0, 110.1 IP, 3.10 ERA, 2.67 FIP, 3.3 WAR) had another fine outing, keeping the Rays to just 3 runs in 7 innings while striking out 9 and pitched in almost no traffic, allowing 2 of the 3 runs on solo homers. But the other track was no less impressive as Miguel Cabrera led the way with 2 HR, a single, and a double, moving his season numbers up to 209 wRC+ and 5.4 WAR, both of which are easily MLB bests. But it was Prince Fielder who sealed the deal with a majestic homerun that hit the catwalk in RF, perhaps as it was still traveling upward. The bullpen shut the game down in the final two innings and put the Tigers in position to take the serious to take the series Saturday behind Justin Verlander (8-5, 97 IP, 3.90 ERA, 2.86 FIP, 2.8 WAR). The Moment: Fielder hits the catwalk on a 2 run HR in the 7th. 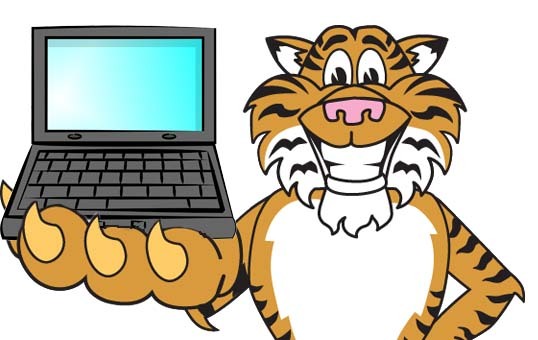 On this edition of the podcast, I cover why you shouldn’t panic about the 2013 Tigers, why it’s time to see what Bruce Rondon can do, how Cabrera’s 2013 season is better than anything he’s ever done, our new reliever statistic SOEFA, and why RBI and Wins aren’t good statistics for measuring individual performance. The author wishes to point out that he misspoke near the 8:00 mark when he said Dirks is having one of the best offensive seasons in the league. He obviously meant defense. Dirks is good at defense. Feel free to send questions for future editions of the podcast to @NeilWeinberg44 on Twitter or to NewEnglishD@gmail.com. Bruce Rondon has nothing left to prove in Triple A. The minor leagues aren’t a challenge. He throws too hard for anyone to handle him. Tons of strikeouts, but also his share of walks. He hardly ever gave up runs, and has only allowed a few homers. There’s just nothing left to prove. He might not be major league ready, but we’ll never know without putting him feet first into the fire. The Tigers bullpen has been taxed as the starters have stubbed their toes in the last few days and they needs reinforcements. The hot hand and the top relief prospect is the fireballing Rondon. It’s time. I don’t know who he’s replacing just yet and I don’t know how Leyland plans to use him, but I have a suspicion we’ll see him pitching as the “closer” sooner rather than later. He’s exactly what Leyland and Dombrowski value in a closer. He throws hard, is kind of erratic, and has a “closer mentality.” I think most of that is nonsense, but I think he has what it takes to succeed in leverage situations, so I’m not going to cause a big fuss. He’s going to strike batters out, but he’s going to walk some too. If you squint, you’ll probably think it’s Jose Valverde circa 2010 with a little extra on his fastball. More than anything, he seems ready. I wrote a few weeks ago about how Castellanos should get the call when he’s ready, not when it makes financial sense. The same is true for Rondon. It’s especially true for Rondon because relievers have short shelf lives. Relievers are relievers because they’re fragile or have a limited repertoire, so let’s get all we can from them before they lose it. Velocity peaks early, so let’s get everything we can out of his 100 mph arm. He averages 99.3 mph during his 2 inning stint in Detroit earlier this season. The slider is a good pitch, but the command is a problem. To get big leaguers out, he’s going to half to pitch against them. You can’t learn by facing hitters who can’t touch your fastball. Don’t overreact to his first appearance, good or bad. Don’t make up your mind based on small samples. Let’s go to Rondon and see what he can do. And remember, don’t look at saves. But do look at SOEFA, the new reliever stat from New English D.